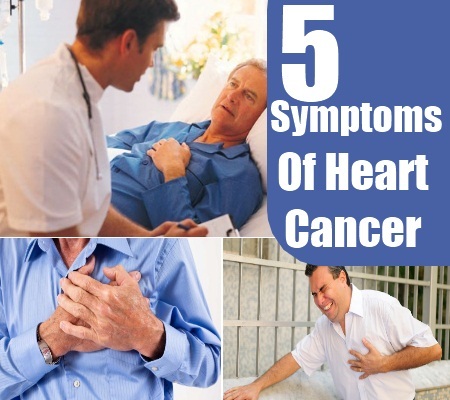 [toc]Heart cancer symptoms are not just rare but also very difficult to recognize. There are two types of tumors with which these signs are associated – primary and secondary. In the primary type, the cancer is limited to a small area and has no effect on the surrounding body parts. In case of the latter, the tumor is known to spread far and wide to the other body organs. Regrettably in cases of heart cancer, the second type is more common and the fatality rates are high. So it is very important to detect such cancerous growth and nip it in the preliminary stage. 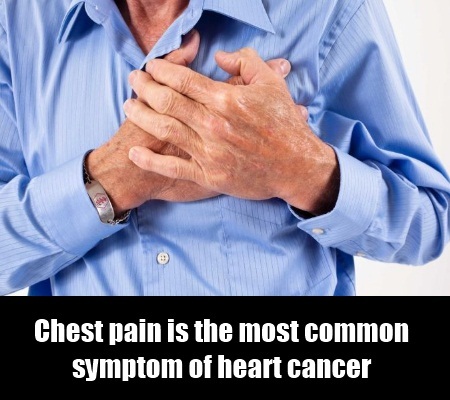 Chest pain is the most common symptom of heart cancer and also the very first symptom that doctors look for while diagnosing any heart disease in a patient. It is also true that chest pain could also be triggered by a number of other causes which may have nothing to do with the heart. 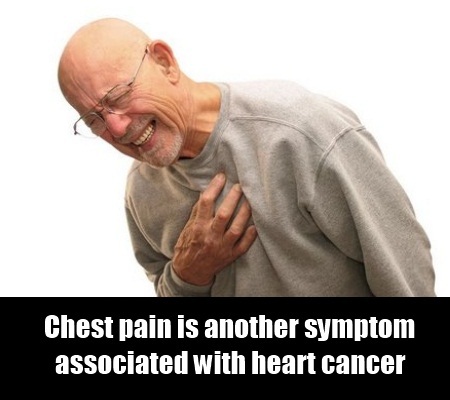 A more specific way of recognizing the chest pain as symptom of heart cancer would be locating where it is emanating from. Most often heart-related chest discomfort is centered around the breastbone, slightly on the left of the center. 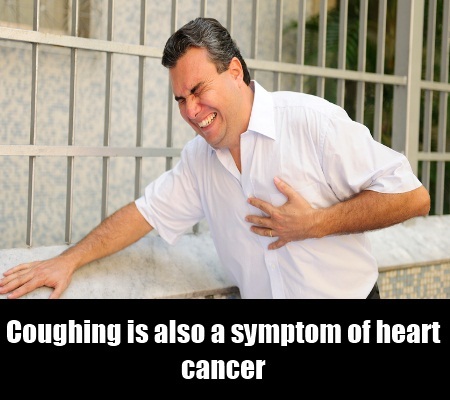 If you are coughing a lot or wheezing, it could well be a symptom of heart cancer too. This is mainly due to the accumulation of fluid in both lungs. In certain extreme cases, patients are also known to cough up blood along with mucus and phlegm. However, again, coughing could mean a lot of things and not necessarily something as rare as heart cancer. So it is always best to not panic and check with your physician to get a clearer picture. Pericardial pain or pericarditis is associated with the swelling of the pericardium – a sac-like tissue surrounding the heart. It causes acute chest pain in the affected, which is another symptom associated with heart cancer as mentioned earlier in the article. Although this condition is generally thought to be a result of bacterial or viral infection, there are reports of cancerous growth in the pericardium as well as the spread of cancer to the pericardium from another part of the body. 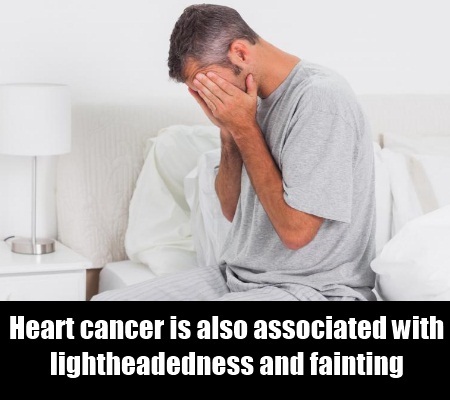 Heart cancer, like other heart ailments, is also associated with lightheadedness and fainting. In case of women, it is seen that quite often extreme fatigue shows up as a symptom of heart cancer. A lack of appetite and nausea can also be symptoms of a tumor in the heart. The patient could feel sick to the stomach and throw up multiple times a day to relieve himself of the uneasiness. In extreme cases, consult your physician as soon as possible. People who start feeling winded even at rest or with the slightest exertion are known to suffer from pulmonary disorders such as asthma. But a lot of heart specialists claim that breathlessness can indicate failure of the heart too. 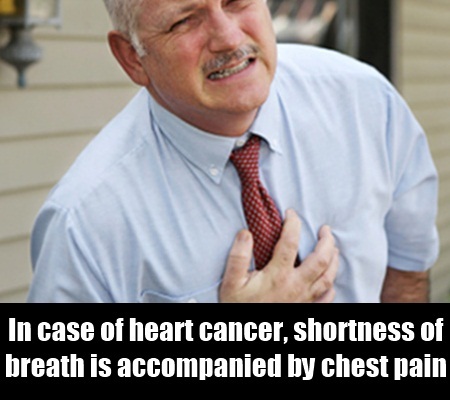 In case of heart cancer, shortness of breath is accompanied by severe chest pain. Patients complain of a feeling of immense pressure on their chest during such bouts of breathlessness. If you don’t have a pulmonary condition such as asthma and yet you’re suffering from shortness of breath, it is time to see a doctor. Heart cancer is not a disease that can be treated at home. It needs close medical attention and regular checkups are mandatory for patients who have a history of heart problems. If you are suffering from any of these symptoms, go for an immediate diagnosis.